Prime Minister had approved the setting up of an Inter Ministerial Group to do preparatory work for setting up a Amritsar-Delhi-Kolkata Corridor (ADKIC). The IMG was to examine the feasibility of setting up the Corridor using the Eastern Dedicated Freight Corridor as a backbone and the structural and financing arrangements that would be required to operationalise it. (i) The ADKIC will be aligned to the EDFC and will span 20 cities in the seven Statesof Punjab, Haryana, Uttar Pradesh, Uttarakhand, Bihar, Jharkhand and West Bengal. The ADKIC also proposes to leverage the existing Highway system on this route andthe Inland Water System being developed along National Waterway-1. 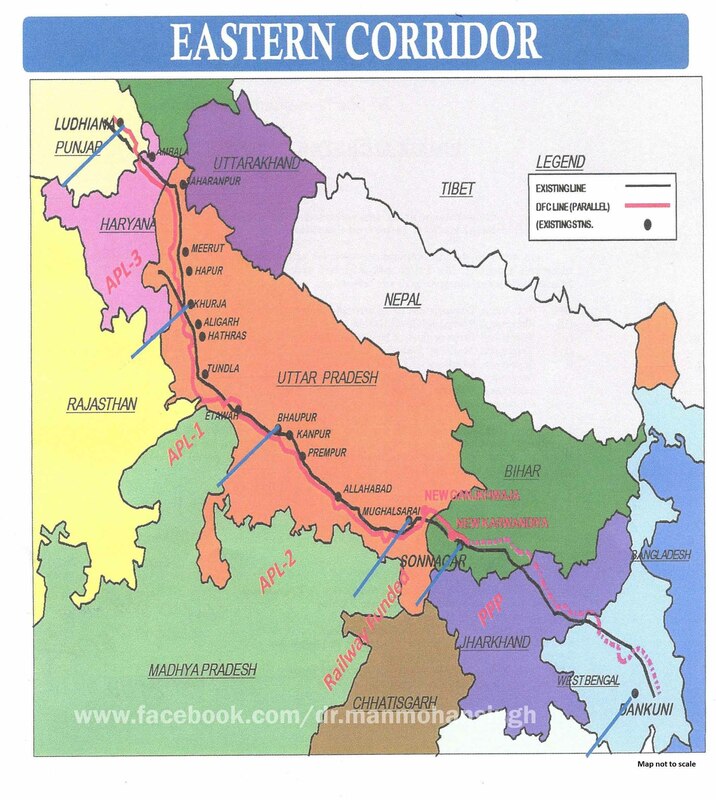 (ii) The development of ADKIC be taken up in a band of 150-200 kms on either side of EDFC, in a phased manner. In the first Phase, every State could promote at least one cluster of about 10 sq. km. area to be called Integrated Manufacturing Cluster(IMC), in which 40 per cent area would be earmarked permanently for manufacturing and processing activities. (iii) ADKIC will use both the Public Private Partnership (PPP) approach and non-PPP approach. The non-PPPable trunk infrastructure will be developed by the Special Purpose Vehicle (SPV) or Implementation Agency vested with the task of setting up the IMCs, through grant-in-aid. (iv) Constitution of – (a) an Apex Monitoring Authority, under the Chairmanship of the Union Minister for Commerce and Industry, for overall guidance, planning and approvals, setting up of timelines for implementation and monitoring thereof; (b) anInter-Ministerial Group(IMG) chaired by Secretary, Department of Industrial Policy and Promotion (SIPP) to appraise proposals both for grant of in-principle approval and final approval for Clusters and NIMZs (in second phase); and (c) a Dedicated Agency(DA) – Amritsar Delhi Kolkata Industrial Corridor Development Corporation, to be set up as a corporate entity, on the lines of Delhi Mumbai Industrial Corridor Development Corporation (DMICDC). (v) A dedicated cell under the Chairmanship of Chief Secretary/Industrial Development Commissioner is recommended at state level. (vi) At the cluster level, a Special Purpose Vehicle (SPV) may be set up by the State Governments for administration of clusters. (vii) In the first phase, an estimated maximum financial commitment of about Rs. 5749 crore, (for seven IMCs each of 1000 hectare) phased over 15 years, by way ofbudgetary support by the Central Government, is proposed. This would include support for (i) interest subvention (ii) development of trunk infrastructure (iii) share in equity and (iv) initial grant to ADKICDC for Project Development. (viii) IMG has recommended a two stage approval mechanism, an “in-principle” and final approval. 3. In order to finalise the next steps, Principal Secretary will hold a meeting with the members of the IMG and other relevant ministries on Friday, 20.9.2013. In order to give a boost to industrial development in the densely populated states of Northern India, the Prime Minister has approved the commencement of preparatory work on creating an Amritsar – Delhi – Kolkata Industrial Corridor. 2. 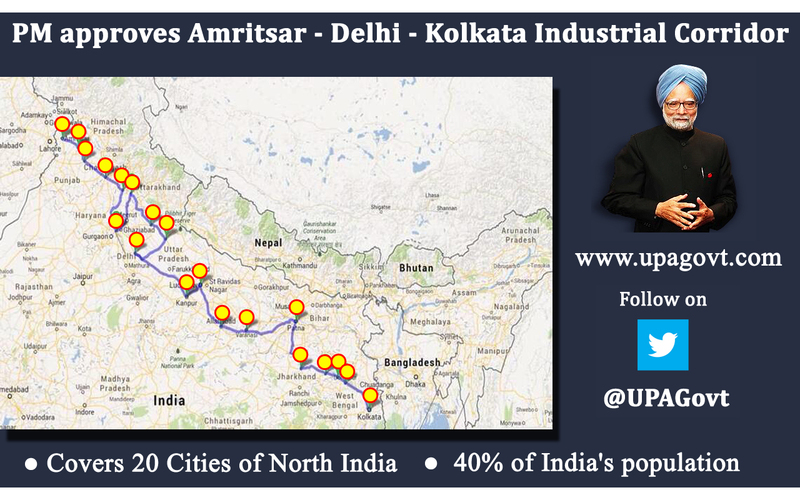 The Amritsar – Kolkata Industrial Corridor is patterned on the Delhi-Mumbai Industrial Corridor (DMIC). The DMIC uses the Western Dedicated Freight Corridor as the backbone and is one of the most significant developments taking place in the sphere of industrialization. The DMIC has financial support from the Japanese Government and is expected to attract large investments leading to rapid industrial growth in Rajasthan, Gujarat, Haryana and Maharashtra through the development of new cities, industrial zones, and world-class infrastructure. 3. In a similar manner, the Amritsar – Delhi – Kolkata Industrial Corridor will use the Eastern dedicated Freight Corridor as the backbone. The Eastern DFC extends from Ludhiana in Punjab to Dankuni near Kolkata. Therefore, the Amritsar – Delhi – Kolkata Industrial Corridor will be structured around the Eastern DFC and also the Highway system that exists on this route. It will also leverage the Inland Waterway System being developed along National Waterway – 1 which extends from Allahabad to Haldia. 4. The Amritsar – Delhi – Kolkata Industrial Corridor will cover the states of Punjab, Haryana, Uttar Pradesh, Uttarakhand, Bihar, Jharkhand and West Bengal. This is one of the most densely populated regions in the world and houses about 40% of India’s population. This is a region which needs a major push for industrialization and job-creation and the Amritsar – Delhi – Kolkata Industrial Corridor will act as a catalyst for this growth. The corridor will cover the cities of Amritsar, Jalandhar, Ludhiana, Ambala, Saharanpur, Delhi, Roorkee, Moradabad, Bareilly, Aligarh, Kanpur, Lucknow, Allahabad, Varanasi, Patna, Hazaribagh, Dhanbad, Asansol, Durgapur and Kolkata. 6. This Inter Ministerial Group will examine the feasibility of setting up the Amritsar – Delhi – Kolkata Industrial Corridor along with the structural and financing arrangements that would be required to operationalise it at the earliest. The IMG will give its report within a month.